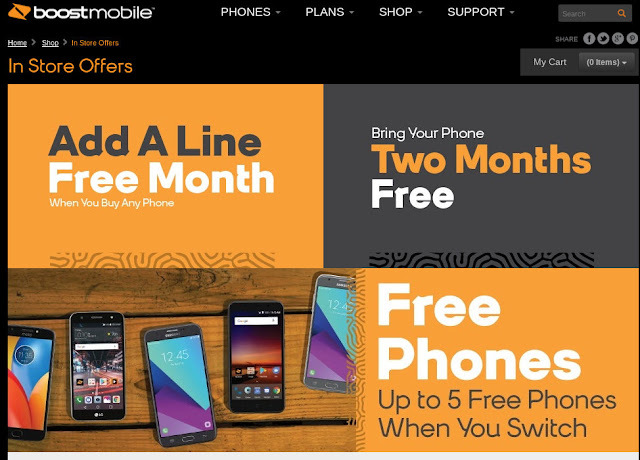 Sprint's Boost Mobile prepaid brand has extended several promotions that were originally due to end January 3. 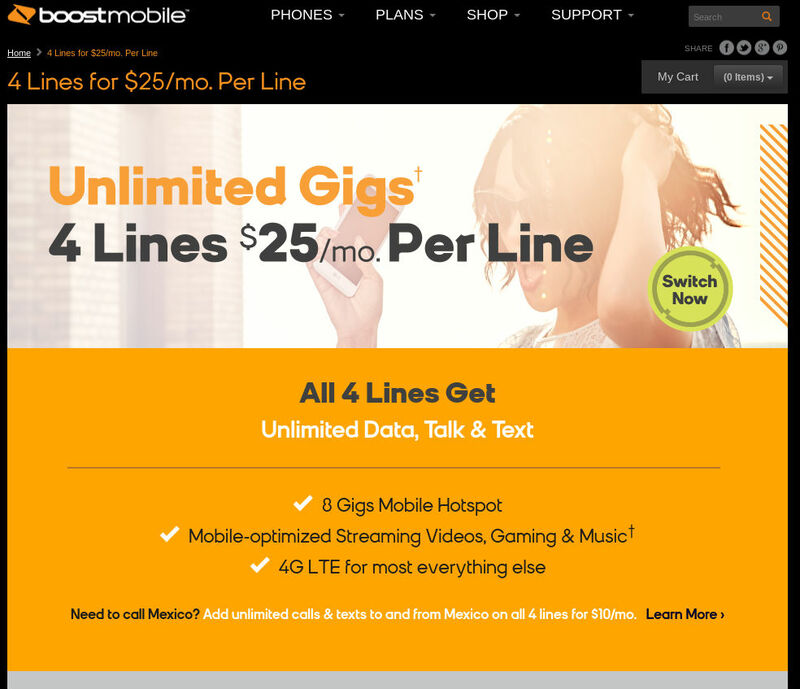 The 4 Lines of $50 Unlimited Gigs Plan for $100 offer has been extended until January 29. All lines must be new activations and at least one must be a port-in. Five lines are $125. Todo Mexico, which includes unlimited Mexican roaming, unlimited calls to Mexico and Canada and unlimited international text messaging, can be added all lines for $10 total. 4 Lines for $100 used to be available only at dealers but it's now listed on the Boost site separately from the in store only offers, so it might be available online or through telesales now. The following offers are listed by Boost as in-store only and are limited to participating dealers in selected markets. As always with store only deals, call the store first to verify availability and avoid disappointment. Add a Line, First Month Free add a new Unlimited Gigs line of service to an existing individual or family plan and get the first month of service for free. Extended until February 8. Bring Your Own Phone, Get Two Months Free Activation of a new line of service on the $50 Unlimited Gigs plan required. Extended until February 8. Buy One Phone Get One Free requires activation of a new line of service on the $50 unlimited plan. The offer is available to "new, port-in, or qualified upgrade Family Plan customers who have not upgraded in the last 120 days". The free phone must be of equal or lesser value than the purchased phone. Available for an unspecified limited time. Once again single line users get shafted. Sprint doesn't have the network to justify thier prices. Not really. Boost is $50 including taxes for single if "unlimited" service which is cheap as it gets. I'm not a big fan of Boost but it's not their plan prices that are the problem. $50 is not a good price for Sprint coverage. You can get much better service on Metro, Cricket, or any number of Verizon MVNOs. Boost doesn't even offer Canada roaming. These offers are simply not attractive if you're a value customer (like me). They should be slashing their prices, $20 for 3GB and $35 for Unlimited. Sprint should be driving customers into stores by any means necessary. Instead they're acting like their service is within "1%" of the other guys when they're still running on 3G and Verizon roaming in 2018. Yes, charging Chevy prices for a Yugo isn't sustainable. Boost needs to cost less than the better carriers. For a family of 4 in a good Sprint coverage area this plan is great. I agree, if it works for you, then it does. You know my row boat cannot get me across the atlantic, but it is good for the occasional fishing trip with friends. My pickup cannot haul 100 tons like a Catepillar, but it good for moving my washer and dryer. Each carrier has their niche. Some carriers do what everyone else does as well, but, that does not mean that there is a carrier that does not work AT ALL, if that were the case, then yeh,its time to pack up. The problem is, if you are hauling with that pickup and it breaks down, you sure better hope you have Verizon, because with Boost chances are you won't be able to send that email to the person you were making the important delivery to. Thank you for making my point very clear. If a person is indeed working in an area that inly Verizon works, then they indeed will only use Verizon. But if they are working in an area with Sprint/Boost service, then why not. Its like saying,the deli sells Poland and Perier, so I must get perrier since there is a store 10 miles away that only sells perrier. Why can't I buy poland when here poland is available? You are missing that mobile phones are meant to be mobile. Why not get a service that is good when you leave the house as well as inside it? The Poland and Perrier analogy works if the person involved is always carrying around two phones period in order to have two alternatives. How many of us are willing to carry around two phones like this?? None. People will tend to carry just the phone that works on the better network and get rid of the one that works on the worse network. Mobile phones are indeed mobile, or are they? My mobile phone will not work on the moon, in caves, in antartica, in deep valleys, or undersea. Does that means that my phone does not work in the cities that I know it works in? I use a service that works for me. Beating an old fead drum here, people use services that work for them, and so, it seems that Sprint does work well enough for enough people. I agree. Plus, Tmo just added 1.85m subscribers last Q. More than 5m for 2017, the 4th year in a row >5m. Those millions of people didn’t pay more for coverage they decided they didn’t need, and neither should anyone else. These new T-Mobile customers joined because of all the new T-Mobile coverage. And T-Mobile is moving to cover the rest as fast as it can because it doesn't want to turn customers away. "Coverage I don't need",said no one ever other than a Boost fanboy. And it is interesting that a Boost fanboy finds the idea of providing good coverage in the US... something other networks do... as being as difficult as covering the moon. The other networks get far more customers because it turns out they need good coverage in the US. All the blind love of Boost and bashing of good coverage makes me think of the Titanic sinking, and some passengers being proud of the big hole in the hull and condemning other ocean liners that aren't sinking ... for having unnecessarily intact hulls. If my local pizza shop does not and cannot deliver beyond a five mile distance, does that mean that if I live in that 5 mile radius Inwill not magically not get any pizza delivered? The TMO fanboy does understand what it entails to cover the US in reliable coverage, now a question can be asked, why is it that the other side just cannot understand why something that is not the most powerful is not not usable? Is not not usable? The mental somersaults people go into to defend significantly inferior coverage can be amazing. I am a fanboy have any good Network. Boost covers only 10 or so States adequately. And has very tiny coverage. Yes, it might meet the needs of a few. But it is deceptive to advertise it as if it will be good for most people. Now, why not not not not not have a slice of that? With anchovies. I'm not sure what the double-negative pizza guy is getting at. Apparently, he is arguing in favour of cell carriers with only a 5 mile radius. Good luck with that, cap'n. I for one don't relish the idea of when I have to make a road trip from Ohio to Missouri, I have to have a laundry basket full of mobile phone handsets in my car just to be prepared for emergencies. The whole point here is hust the following. There are plenty of people who are not making road trips. There are plenty of people who just stay in one place, they go to work, they come home, go to work, come home. This is true, not sure about everyone, but for enough people that such a service is a viable option. There is no mental somersaults here to defend anything. What is amazing is why noone understands the concept of overkill. If you never take road trips, then, it is overkill to have service in a part of the country that you never visit. People living around the equator do not invest in winter clothing, a light jacket in case of those more rare chilly nights that might happen, but they never expect 3-4 four feet of snow. Then one can say that all things are inadequate. Do you speak every language on thenplanet? Maybe you will spontaneously teleport into China and not know how to ask for directions.And if you do speak Chinese, then the arguement can just be expounded upon ad infinitum. Do you own a catepillar? Maybe you will wish to move 100 tons of dirt. etc etc. There seems to be enough people that Sprint senses that they can make money and keep in business with what they are providing. Does Sprint work consistently and reliably for a sizable amount of people do not sense that they are not able to make calls and use data? This might be the case. Customer choice and survey after survey say "probably not the case". American cell customers don't expect it to be unreasonable "overkill" to expect their cell phones to just work when they leave their homes. Thanks for illustrating why Sprint is falling by the wayside. Are you there yet? Can you hear me now???? Is it truely this extreme? Is it not usable by ANY segment of the population? Boost roaming is extremely limited allowance. MIGHT be OK for a short duration emergency, not much else. Boost roaming is extremely tiny. A minuscule amount of data, that is but a fraction of what the average American needs for data lately. You might be able to listen to one or two stream songs and then you've run out. This is actually typical of roaming allowances for every company. This is why roaming is rather looked down upon compared to real native coverage. Because real native coverage is what actually counts. What isnsondifferent about Boost roaming that makes it so limiting? How many MB do they allow on roaming, how many miniutes do they allow on roaming? Roaming on Boost is limited to 50 minutes per month. Roaming data is not available at all. How many MB in roaming ? The answer is zero. That leaves only about 20% of US states where you can use Boost data at all without much problem. The person who thought that boost had roaming on data might have been confusing it with the Sprint "postpaid extended roaming areas". - "extended roaming" only covers a small area. - unlike with the Sprint and Boost native footprint, Sprint considers providing data to customers in "extended roaming" to be optional and just a possibility on their part. - customers report having their data on "extended roaming" cut off after using a very small amount. 1. "Extended coverage" for voice and data. Customers use of these partner networks is included in Sprint and Virgin Mobile Inner Circle plans. Usage in these areas should not exceed 50% of total usage. 2. "Roaming coverage" for voice and data. Customer use of these other partner networks (e.g., Verizon) is limited to the amounts stated in the customer's plan. Example: 800 minutes/month. A few customers have reported problems with their ability to use partner networks. It is impossible to draw any valid, overall conclusions about Sprint coverage from these individual posts because we don't have the facts in each case; we're only seeing what people posted. These posts certainly do not negate Sprint extended coverage and roaming coverage shown on Sprint's map. Sprint customers can see their use in these areas for themselves in their online account and the Sprint app. Contrary to the above, it us important to consider customer experience, which are quite well documented, before committing to Sprint. Each one of the 10:21 AM points still stands. I am a Boost customer on the five for $100 family plan. I accepted less coverage on Boost in exchange for a lower price expecting the 50 roaming minutes to fill in the gaps. I live in an area with excellent Verizon coverage. My Android phones are set to allow domestic voice roaming and international roaming. I lose connection at least twice per day while in strong Verizon coverage. To my knowledge, I have never roamed. Does anyone know how to get roaming on Boost? Good question... if you can't figure out how to enable Boost roaming yourself, do you have a local Boost store or at least a Best Buy to ask? Boost only has roaming in some areas where there are no Sprint towers. Check coverage map. Has any Boost customer been able to persuade Boost to give/loan them a signal Booster? T-Mobile loaned me a signal booster when I was a customer of a business plan reseller. I read an article that said Sprint is distributing one million Magic Box signal boosters. Coupled with a strong Boost or Virgin promotion, this would be enough to bring me to Sprint.